I would like to take this opportunity to extend our sincere appreciation to your entire staff for the excellence afforded to this unique project. The results are stunning, coming not only from the design team, but also from the multitudes of visitors to the facility. Gibbs Construction is truly a premier construction services provider. 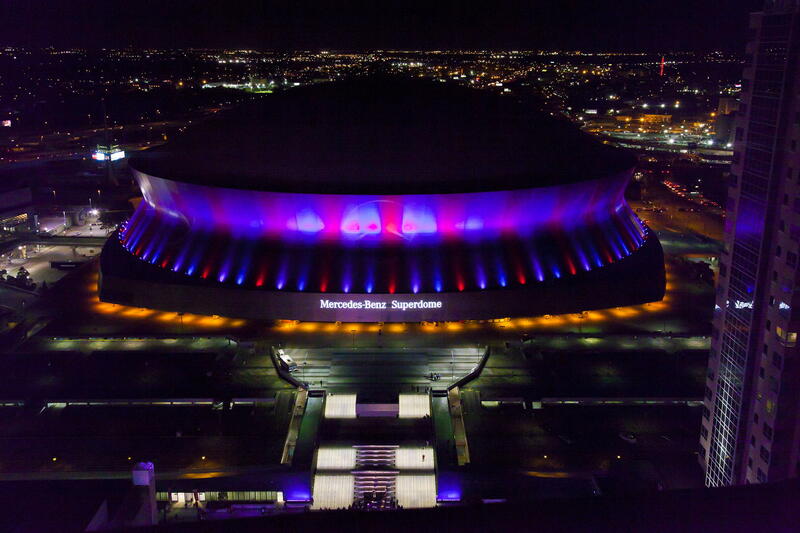 The $19.3 million post-Hurricane Katrina renovations to the Louisiana Superdome featured new inventions and one-of-a-kind construction, design and engineering techniques developed for the replacement of over 400,000 square feet of exterior metal skin layer. The new skin used 16,000 new independently removable panels with an adjustable structural sub-framing clip attachment system (tested to exceed code requirements and withstand high wind conditions that would be encountered from storms or hurricane-force winds), over four-inch-thick spray foam insulation coated with polyurea waterproofing. Gibbs also installed new club level windows into newly created openings, after selective demolition of the exterior wall system, mechanical louvers and substructure. Additionally, the project involved replacement of expansion joints and cover plates, and the installation of two escalators located on the plaza level to access the ballrooms.